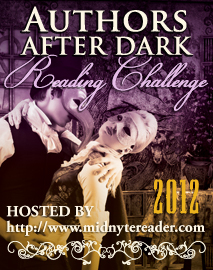 Midnyte Reader: 2012 AADNOLA Reading Challenge Winners! This was a little surprise contest that I held. The participants did not have to do anything except post their reviews. Cat Named Easter (Caroline) - 8 posted reviews on Facebook. Brandy Swain from All the Fun Starts After Dark - 6 posted reviews. Thank you for joining the Challenge ladies and enjoy your Amazon Gift Cards! If you'd like to check out the books the participants read please click HERE. Annnnd...if you would like to join my 2013 AAD Savannah Reading Challenge please click on the button located on the sidebar.